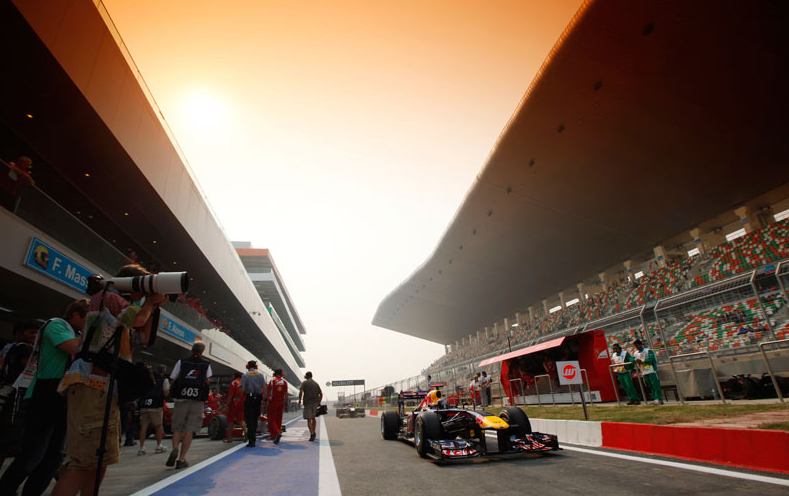 Indian F1 Airtel Grand Prix is scheduled for 28 October 2012. The Buddh International Circuit will host the second Indian Grand Prix and the ticket prices for this year’s event have varied considerably. While the tickets for the grandstand at the Buddh International Circuit will peg almost Rs 5000 less, the cheapest will peg about 50 percent more, the organizers said on Tuesday as the tickets for the October race went on sale. For a three day pass at the grandstand, you will have to spend Rs. 30,000 unlike the Rs. 35,000 in the debut year. This pass is valid for the three-day event and is inclusive of food and beverages; however they do not include the parking charges. While the natural stand tickets cost Rs 2,500 last year, this year they will be dearer by a thousand bucks and will cost Rs. 3,500/-. Jaypee Sports International (JPSI) is also offering limited number of seats for the Sunday’s main race in the grandstand costing Rs. 20,000. This ticket cost Rs 15,000 in the debut year. Early booking for grandstand will earn exclusive BIC merchandise. JPSI have not altered the prices of the star and classic stands, which pegs Rs. 8,500 and Rs. 6,500. Sameer Gaur, MD & CEO, JPSI, launched the sale of tickets and the first tickets were given to IPL team Deccan Chargers that was present at the launch ceremony. With the picnic stand merged with the natural stand this year, the seating capacity at BIC is expected to drop from 100,000 in 2011 to 99,384 in 2012. Sameer Gaur explained the reason for putting the tickets up for sale so early. He suggested that, with an early booking, local and foreign visitors could plan their tour around the event. They could plan a visit to Taj Mahal, which is a two hour journey from Noida, where the track is located. The first edition of F1 Indian Grand Prix was a huge success with over 95,000 spectators turning up at the BIC, while the cheapest tickets were sold out within three days of their launch.